1790, Yale University Lewis Walpole Library. For as long as man has used gunpowder in warfare, he has stuffed whatever would fit into a barrel and fired it off. An unexpected find by the archaeologists working on the fabled 1718 wreck of the Queen Anne's Revenge was called to my attention by follower Adam Hodges-LeClaire and sparked my interest. 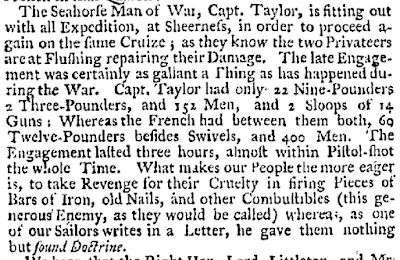 Several news stories reported that a page fragment from Edward Cooke's 1712 A Voyage to the South Sea, and Round the World was found in the remnants of a cannon on Blackbeard's former ship. It may have been wadding and not terribly unusual, nor perhaps even improvised, but archaeologists did find a bundle of iron rods packed in the barrel of a swivel gun. LANGREL, or LANGRAGE, (mitrailles, Fr.) a particular kind of shot, formed of bolts, nails, bars, or other pieces of iron tied together, and forming a sort of cylinder, which corresponds with the bore of the cannon, from which it is discharged. This contrivance is particularly designed to wound or carry away the masts, or tear the sails and rigging of the adversary, so as to disable him from flight or pursuit. It is never used in royal ships, but very often by privateers and merchantmen. Most examples of improvised projectiles fit into this definition. Langrage appears to be roughly synonymous with 'canister,' a term not defined in Falconer's Dictionary of the Marine that appears less frequently in period sources than langrage. Langrage was not improvised but deliberately manufactured. 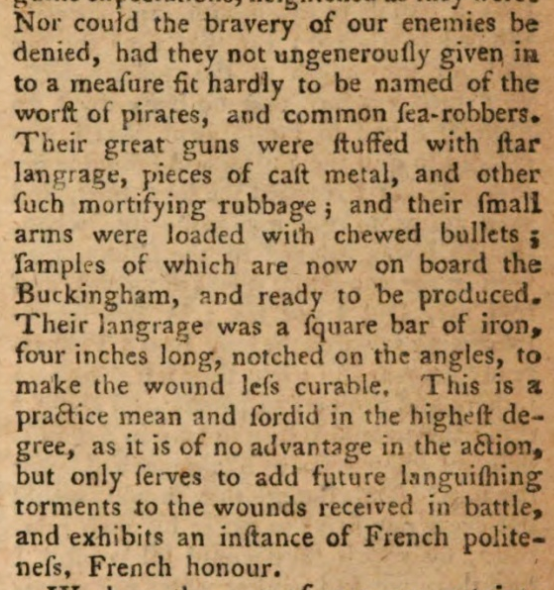 Numerous newspapers announce the amount of langrage captured from French forts, just as official requests by American naval officers during the Revolution ask magazines and state governments to provide langrage for their ships. I was serving powder as busy as I could, the shot and splinters flying in all directions, when I heard the Irishmen call from one of the guns (they fought like devils, and the captain was fond of them on that account), 'Halloo, Bungs, where are you?' I looked to their gun and saw the two horns of my study across its mouth. The next moment it was through the Jason's side. The rogues thus disposed of my study, which I had been using just before the action commenced and had placed in a secure place, as I thought, out of their reach. 'Bungs for ever!' they shouted when they saw the dreadful hole it made in the Jason's side. There was about 20 odd of us on board but no arms to defend ourselves, except a short brass piece which was intended to be shiped on the capstan on the quarter deck of the privateer in case of boarding at close quarters. As luck would have it ther was cartriges sent with the 4 pounder, but no shot, as it was intended for musket balls. We lashed this piece to the bitts as secure as we could with rope, put a good charge into her; having no balls, the capt of the boat had a bag full of old nails, hooks, and thimbels, and we filled the peace to the muzzell. When they ware rounding two to come a longside, as they ware stem on, we left fly, which raked them fore and aft, not more than 8 or 10 yards distance. It came on them unexpected, like thunder. The shrieks and moaning were terible. She pulled 26 or 28 ores. Laying for a minnute in that sittuation, and the few that remained unhurt saw our deck full of men, expecting we ware well armed, we saw about 4 or 5 got out their oars and pulled away for the Jarsey shore. The gun carried away the lashing and fell over on the opposite side of the deck, however it was not wanted more. They not only fired Bullets into us, but slugs, chew'd Bullets, old Nails, Bottles, Stones, in short, every thing that the Mind of Man could devise most destructive to the Wretch that was so unlucky as to be wounded. Here we see reflected a trend in the British rhetoric. 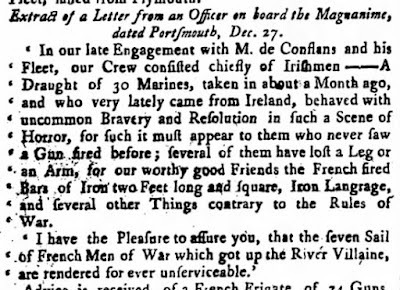 Captain Carey clearly disapproved of improvised projectiles, and cast the French as villains for wishing a terrible fate on their enemies. This was a constant refrain in the British press, and was just as often declared when langrage and improvised projectiles were used afloat as ashore. 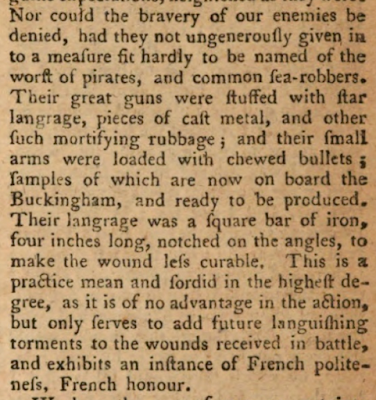 One widely reprinted account of the death of Hanoverian General Zastrow went into gory detail about the improvised projectiles that 'tore' his body 'according to Custom' of the French. For all their shouting about the supposed violations of the 'Rules of War,' and Falconer's assertion that langrage 'is never used by royal ships,' the Royal Navy was willing to use it when they saw fit. Simeon Deane, reporting to his brother and representative of Connecticut in the Continental Congress Silas Deane in 1775, stated that the 64 gun Asia fired langrage into his ship 'which wounded one or two of our men.' 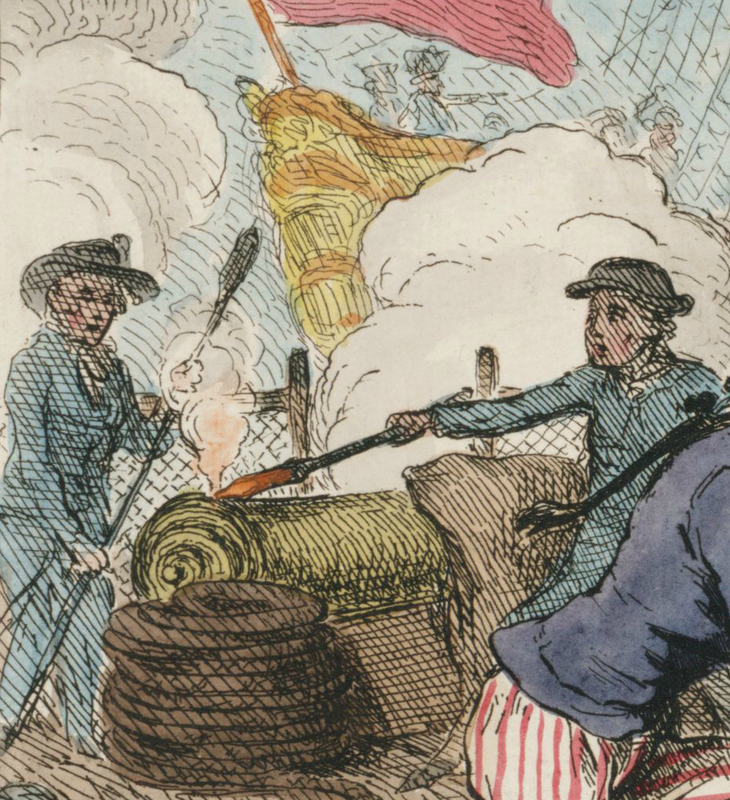 In a 1776 fight between an American shore battery and British armed vessels, there was an exchange 'with Ball, Langrage & Small Arms from both Sides for Several Hours.' In the 1778 First Battle of Ushant, the French under Admiral Louis Guillouet, comte d'Orvilliers reported to their American allies that the Royal Navy used langrage to damage their rigging. The use of langrage was not the first nor last time that a rhetorical battle was waged over an instrument of war. When gas was brought to the battlefield in the First World War, its use was as widespread as the condemnations against it. The hypocritical shouts of armed powers have long decried the suffering and death of wounded soldiers and sailors, and ignored their own culpability. We should not forget that there were human beings down range from these horrifying weapons. During the action, my situation was not one of danger but most wounding to my feelings and trying to my patience. I was stationed in the after-magazine, serving powder from the screen, and could see nothing-but I could feel every shot that struck the Golia[t]h, and the cries and groans of the wounded were most distressing as there was only the thickness of the blankets of the screen between me and them...It is after the action the disagreeable part commences. The crews are wrought to the utmost of their strength. For days they have no remission of their toil, repairing the rigging and other parts injured in the action. Their spirits are broke by fatigue. They have no leisure to talk of the battle and, when the usual round of duty returns, we do not choose to revert to a disagreeable subject. 'Fragments of book recovered from wreck of Blackbeard's ship,' The Guardian, January 11, 2018, accessed February 13, 2019, <https://www.theguardian.com/books/2018/jan/11/fragments-of-book-recovered-from-wreck-of-blackbeards-ship>; Dvorsky, George, "Paper Scraps Recovered From Blackbeard's Cannon Reveal What Pirates Were Reading," Gizmodo, January 5, 2018, accessed February 13, 2019, <https://gizmodo.com/paper-scraps-recovered-from-blackbeards-cannon-reveal-w-1821821451>. 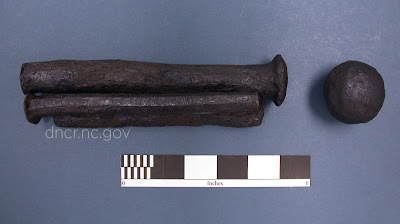 Page, Courtney, 'Langrage,' Queen Anne's Revenge Project, North Carolina Department of Natural and Cultural Resources, March 2, 2018, accessed February 13, 2019, <https://www.qaronline.org/conservation/artifacts/arms-and-armament/langrage>. Falconer, William, An Universal Dictionary of the Marine, London: T. Cadell, 1780, page 184, University of California Libraries via Internet Archive, accessed February 13, 2019, <https://archive.org/details/universaldiction00falc/page/n183>. Nicol, John, The Life and Adventures of John Nicol, Mariner, edited by Tim Flannery, New York: Atlantic Monthly Press, 1997, page 45-46. Nagle, Jacob, The Nagle Journal: A Diary of the Life of Jacob Nagle, Sailor, from the Year 1775 to 1841, edited by John C. Dann, New York: Weidenfield & Nicolson, 1988, page 18. 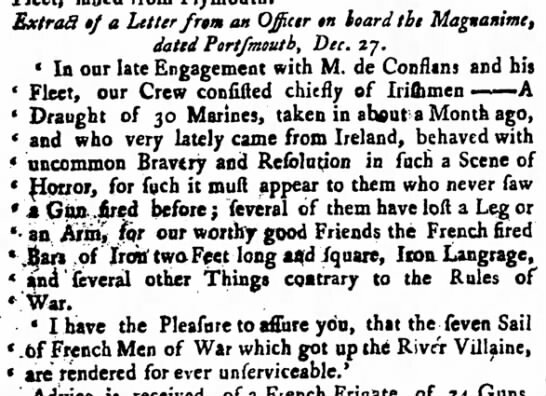 The Boston Evening Post, September 22, 1746, page 4. The Public Advertiser, July 7, 1759, page 2. The Universal Magazine of Knowledge and Pleasure, Volume 23, 1758, page 355, New York Public Library via HathiTrust Digital Library, accessed February 23, 2019, <https://babel.hathitrust.org/cgi/pt?id=nyp.33433081663415;view=1up;seq=417>. The Pennsylvania Gazette, November 3, 1757, page 1. The Public Advertiser, January 15, 1760, page 2. Naval Documents of the American Revolution, Volume 1: American Theatre: Dec. 1, 1774-Sept. 2, 1775, European Theatre: Dec. 6, 1774-Aug. 9, 1775, William Bell Clark editor, Washington, DC: U.S. Government Printing Office, 1964, page 1226, via Naval History and Heritage Command, accessed February 18, 2019, <https://www.history.navy.mil/content/dam/nhhc/research/publications/naval-documents-of-the-american-revolution/NDARVolume1.pdf>. 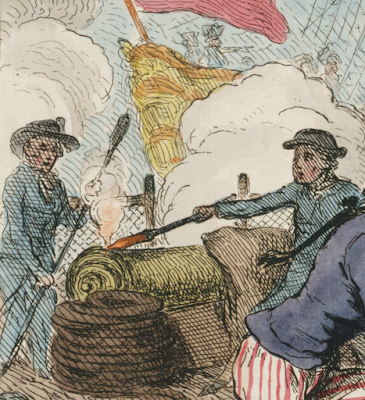 Naval Documents of the American Revolution, Volume 4: American Theatre: Feb. 19, 1776-Apr. 17, 1776, European Theatre: Feb. 1, 1776-May 25, 1776, American Theatre Apr. 18, 1776-May 8, 1776, William Bell Clark editor, Washington, DC: U.S. Government Printing Office, 1969, page 248, via Naval History and Heritage Command, accessed February 18, 2019, <https://www.history.navy.mil/content/dam/nhhc/research/publications/naval-documents-of-the-american-revolution/NDARVolume4.pdf>. The Pennsylvania Packet, October 8, 1778, page 2. 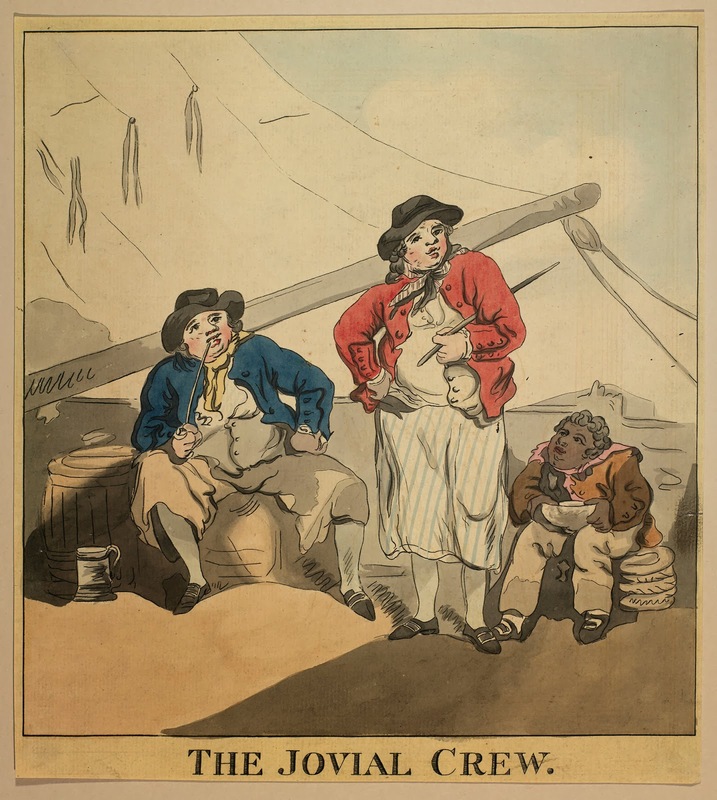 The Jovial Crew, Thomas Rowlandson, 1786, Royal Collection Trust. Among popular historians and in popular culture, sailors of the Atlantic World are usually perceived as existing in distinctly separate services. This is true, but only to an extent. 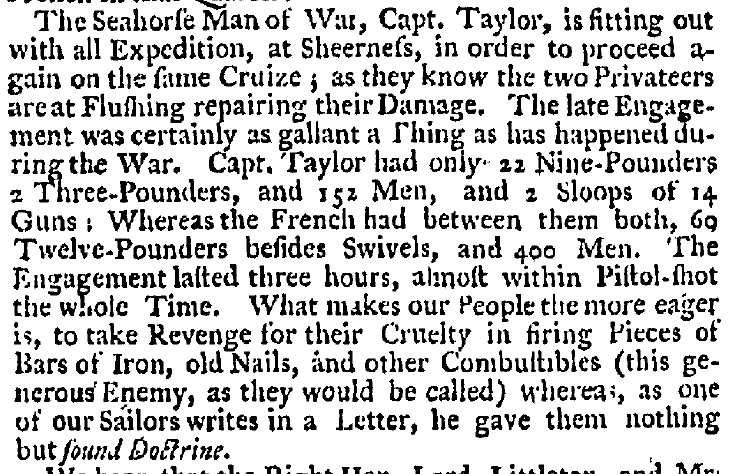 The experience of a common tar on a whaler was indeed very different from his mate on a Royal Navy frigate, and both were very distant from the daily life of a slave ship sailor. And these experiences are worth exploring in themselves. Rodger's Wooden World, Peter Earle's Sailors: English Merchant Seamen 1650-1775, and Marcus Rediker's The Slave Ship: A Human History can and should coexist. But it is also important to remember that sailors generally didn't think of themselves as strictly belonging to a single type of service. Sailors didn't join the navy so much as sign on to a particular ship. Nor did sailors see signing on to an East Indiamen as an irrevocable career decision that destined them only to sail between Britain and India. The willingness to move between different merchant and naval services is readily apparent in The Sailor's Memoirs Project. In a fairly typical example, Christopher Prince began his career on fishing vessels, and eventually took command of a merchantman from New England to Canada, where he was pressed into the service of the Royal Navy, then returned to America and enlisted in the Connecticut State Navy, and found his way back into the merchant trade. More famously, Jacob Nagle bounced all over the earth on merchantmen and naval vessels: enlisting in the Continental Navy, leaving to sign aboard a privateer, briefly serving in the French navy, then the Royal Navy, and later in both American and British merchantmen. Olaudah Equiano had an even more fascinating experience. An enslaved survivor of the Middle Passage, Equiano was held by various naval and merchant officers, and in their service sailed men of war, slavers, and merchantmen. After gaining his freedom, he continued in both the merchant and Caribbean and North American slave trades. Nearly every entry in The Sailor's Memoirs project follows a similar path between the different maritime services. By expanding our definition of sailor's lives, we can open up interesting opportunities in studying the Wooden World. A version of this expanded scope has been underway for quite some time in naval history. In writing his excellent The Struggle for Sea Power: A Naval History of the American Revolution, Sam Willis was explicit in his willingness to break down the arbitrary divisions made within naval histories of the past, Will made 'no distinction between navies operating on rivers and freshwater lakes and those on oceans. The contributions made by the former to this war are of equal significance to those by the latter. Naval historians tend to make a false distinction between "inland navies" and those that disputed "command of the sea," but contemporaries saw no difference. They simply talked of "command of the water," an excellent phrase that has sadly gone out of use.' By expanding the examination of naval history to privateers, fresh water travel and battle, and other theaters, Willis was able to weave a much more complete narrative of the naval Revolution than any previous historian. In their book Young Men and the Sea: Yankee Seafarers in the Age of Sail, Daniel Vickers and Vince Walsh take it even further. They make a strong case for expanding our understanding of sailor's lives to the shore as well. Then, as now, sailors spent most of their time on dry land. Ashley Bowen, typical in his freely changing maritime employment, is examined in depth by Vickers and Walsh, who find that 'for Bowen...merchant seafaring was less a specialized trade than a single element within a broader pattern of maritime employment' both afloat and ashore. Studies of daily life on warships, merchantmen, and slavers are valuable and helpful, but few sailors would have experienced those trades alone, and none would have joined them in a vacuum. Looking at sailors' lives between all services and within the British Atlantic World in which they were raised, can give us a much fuller understanding of the eighteenth century. Rodger, N.A.M., The Wooden World: An Anatomy of the Georgian Navy, New York: W.W. Norton, 1986, page 113. Prince, Christopher, The Autobiography of a Yankee Mariner: Christopher Prince and the American Revolution, edited by Michael J. Crawford, Washington, D.C.: Brassey's Inc., 2002. Nagle, Jacob, The Nagle Journal: A Diary of the Life of Jacob Nagle, Sailor, from the Year 1775 to 1841, edited by John C. Dann, New York: Weidenfield & Nicolson, 1988. Equiano, Olaudah, The Interesting Narrative and Other Writings, edited by Vincent Carretta, New York: Penguin, 2003. Willis, Sam, The Struggle for Sea Power: A Naval History of the American Revolution, New York: W.W. Norton, 2015, page 7. Vickers, Daniel, with Vince Walsh, Young Men and the Sea: Yankee Seafarers in the Age of Sail, New Haven: Yale University Press, page 99.